In the last three weeks, we have been the beneficiaries of many births... Starting on May 11 with 3 births, we have added 14 cria to the West Ranch herd bringing our numbers to 121 alpacas and 7 llamas with a few visitors about to arrive for breeding. We are expecting 3 more in the next week or so and then we will get a break until the onslaught of the Fall births. It is amazing to experience the first few days of a cria's life. Of course the birth process is the best... As the moment arrives, the dam starts to look uncomfortable or sometimes does not even let on that anything is happening. Suddenly, there is a bubble at the back end. Sometimes a nose appears quickly followed by a foot and then another foot. Sometimes it is the foot first and then the nose. From there the pushing begins. Slowly the head makes its way out along with the two front feet/legs. Often the dam will continue to walk around with the front end of the cria hanging from her back end. This part takes 5 - 15 minutes. From there, the front shoulders appear followed quickly by the back legs and then the cria drops to the ground. The dam usually spins around smelling the new arrival while the cria wriggles around for a while in the grass/dirt. 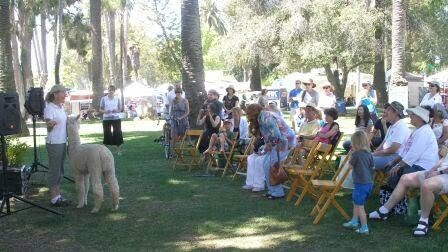 We do not interfere unless the cria does not look as though it is moving in the first 5 minutes. We do not endorse removing the placental covering as this protects the fiber while the cria is rolling around in the dirt getting his/her bearings on life and the dam can recognize the smell and associate that smell with her own cria. The only interference is the quick gender check and sometimes a little clean out of the mouth to be sure there is not too much goop in there. If it is a cold day, we will move the cria into the sun to warm up but we find the first 30 - 45 minutes are so important for the dam/cria bonding and the last thing they need is the busybody human getting in the way! We find that the norm is about 60 minutes from birth to standing and then another 30 - 90 minutes before the cria has found the food supply and is beginning to nurse. We treat the navel area with a 5:1 solution water to cholorohexadine 3 times after birth to prevent infection and help in the drying of the umbilical stub. Then we leave the dam and cria alone. We do not separate them unless there is an obvious problem. We feel that the herd helps in the acclimation of the new cria and the older dams will often model the behavior for the first time moms. If we separate the dam and cria into a smaller pen, it is only for a few hours and never far from the herd the dam has been with up to birth. Alpacas are such social animals that they really do need their herdmates to maintain a healthy balance. Over the next few days, we weigh the cria every day or other day to ensure that there are no problems. We do have the vet out to give the first round of "cria shots" - an all around, one time antibiotic (Amekacin), BOSE, Tetanus Antitoxin, and an ADE. If there is any question, we will run an IGG and we draw blood for the ARI blood card/BVD test. Then we let nature take its course... cria is welcomed into herd, other cria play with new cria, lots of sunbathing, eating, sleeping, pooping and general baby activities. It is a wonderful process and we are so lucky to be able to observe the wonders of the paca world. An amazing thing has happened in the Jessup household. I am the proud mother of four children, 3 girls and 1 boy. Ben is the youngest of the 4 by six years and luckily a wonderfully independent young man who loves his sisters but is definitely not ruled by them. He is an athletic boy who currently plays soccer, basketball and lacrosse. He is involved in some type of sports every afternoon after school and when not participating on a team, he is usually shooting baskets outside, jumping on the trampoline or skateboarding in the driveway. 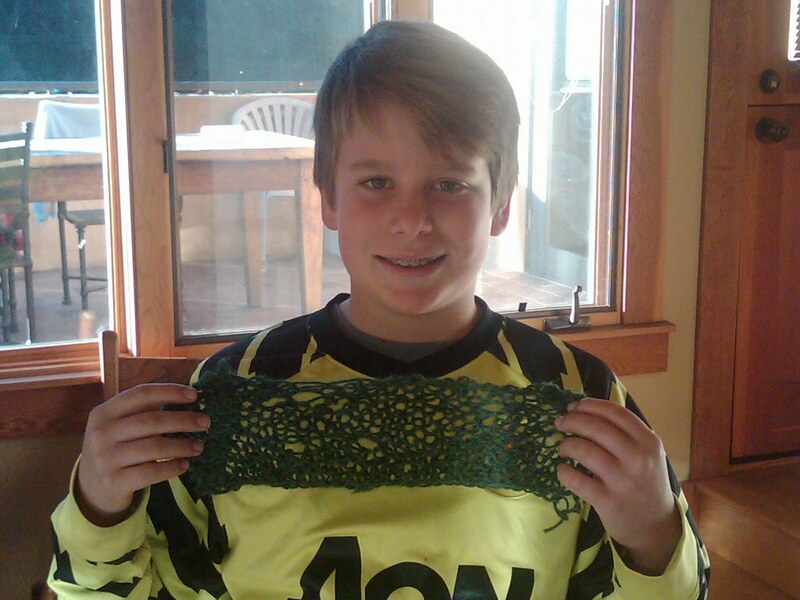 Recently, his 5th grade class has learned to knit as part of their community service project and their art class. The children are learning to make "beanies" for the preemies born at the local hospital. 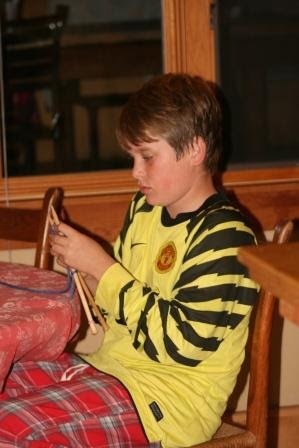 Ben has found that he LOVES to knit. In fact, as I write this, he is watching a movie and knitting. He likes it so much that on a recent outing for a family dinner, Ben brought along his knitting and quite happily pulled it out as he was waiting for his dinner to arrive. Later that evening, as I went upstairs to say goodnight, I found him sitting in the middle of his bed knitting. 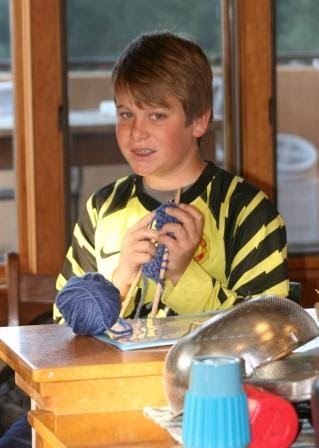 His comment to me was, "Mom, I really like knitting. It calms me down so much. Mom, I think I will knit every night before I go to bed!" He enjoys it so much, he now has his school project and his home project. The school project, a beanie made from alpaca, will be worn by some lucky baby some time in the near future. The home project is a scarf that I have now learned is for his mother (me!) and he is very, very proud of it! I can't begin to tell you how happy this makes me!